Dr. Megan Coffee, MD, PhD is the President of Ti Kay. She holds a B.S. from Harvard College, an M.D. from Harvard Medical School, and a doctorate in mathematical modeling from Oxford University. Dr. Coffee completed her medical residency at Massachusetts General Hospital and has served as a fellow in Infectious Disease at University of California at San Francisco and at University of California at Berkeley. Dr. Coffee has always been interested in pharmaceutical design for infectious disease, particularly by the underlying dynamics of infectious disease spread which she studied at Harvard College. At Oxford, Dr. Coffee examined the mathematical modeling of HIV epidemic spread in southern Africa. Her work focused on the roles played by migration and sexually transmitted diseases in the burgeoning epidemics in South Africa and Zimbabwe. She returned to Harvard to complete her Doctorate of Medicine where she studied under Dr. Paul Farmer, founder of Partners in Health. 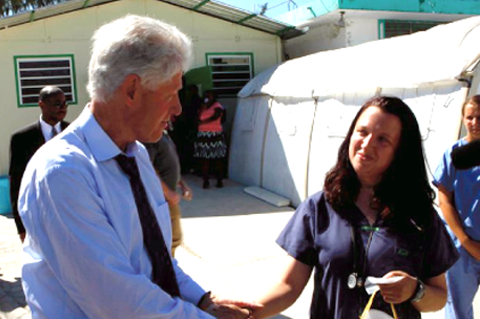 In response to the January 2010 earthquake, Megan relocated to Haiti to focus on the treatment of TB patients.